One of the most popular coins with the world's collectors and investors, the 1 oz American Silver Eagle is also one of the most recognisable. It is the only official investment-grade American silver bullion coin and was first struck by the U.S. Mint in 1986. The Silver Eagle is considered to be one of the most attractive coins ever created and its face features Adolph A. Weinman's famous 'Walking Liberty' with the symbolic image of the American eagle on its reverse. Additionally, it is the only 1 oz silver bullion coin in the world to have its content, purity and weight guaranteed by the United States government. Whether you want somewhere safe for surplus capital or whether you want an investment that will increase in value, the American Silver Eagle is an inspired choice. 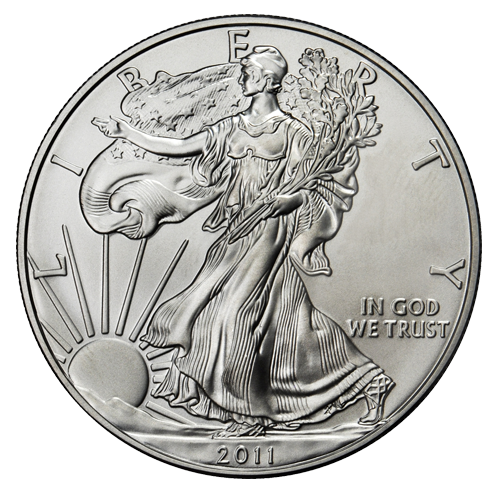 silver-to-go.com is able to obtain 1 oz Silver Eagle coins in larger quantities and pass on savings to our customers. Buyers can purchase Silver Eagle coins singly or in multiples of 20. We always ship securely and swiftly and orders of 500 come in our safety deposit box ready Monster Boxes.